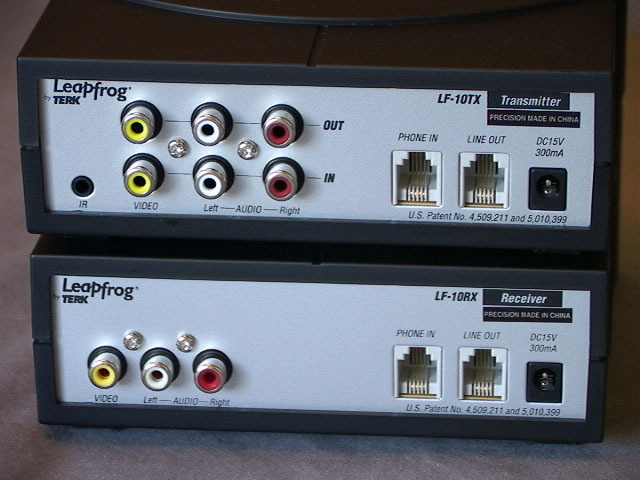 The TERK Technologies LF-10S HomeNetwork A/V System ("Leapfrog") is a small transmitter/receiver pair of boxes, which sends composite video and stereo audio signals over standard telephone wiring. It also picks up IR remote signals on the receiver and and re-sends them out the transmitter side, to control your video source. They claim up to 500 foot range, and advertise that you can still use your phone as a regular voice phone while transmitting video over the same line. It is intended to permit, for example, a TV in the bedroom to view a program from the cable box in the living room (the signal will not make it very far outside your house; this is not intended as a video-phone product). I bought this product to solve a particular problem, sending a video feed from the back of a theater up to the front of the house and then backstage, so the stage manager could monitor it during the show. I used 100' of phone wire with RJ11 connectors (about $5.00) which I strung along the edge of the theater. The system worked very well for this application. I checked out a few more details once I brought it home after the show. 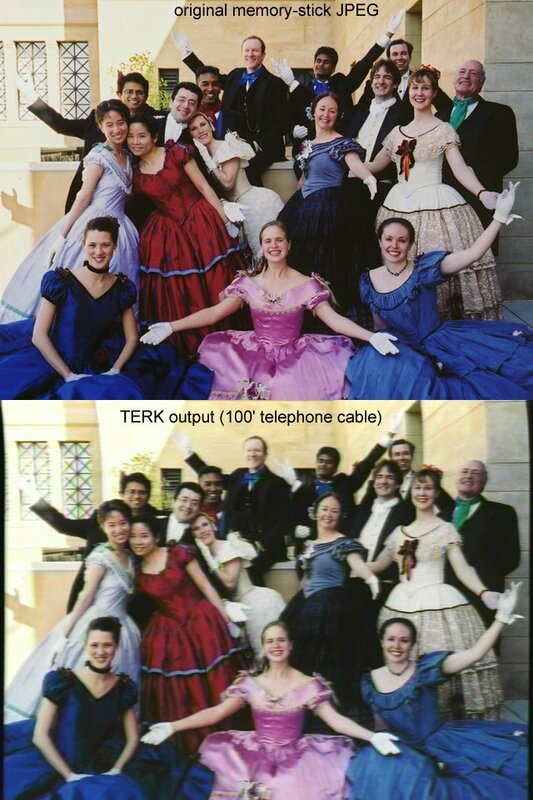 How I tested: I put a few memory-stick images in my VX2000 camera, and used its composite video output into the Terk transmitter, connected through 100' of phone line to the receiver unit, and then took that composite video into the TRV900 analog inputs and recorded it on a MiniDV tape. 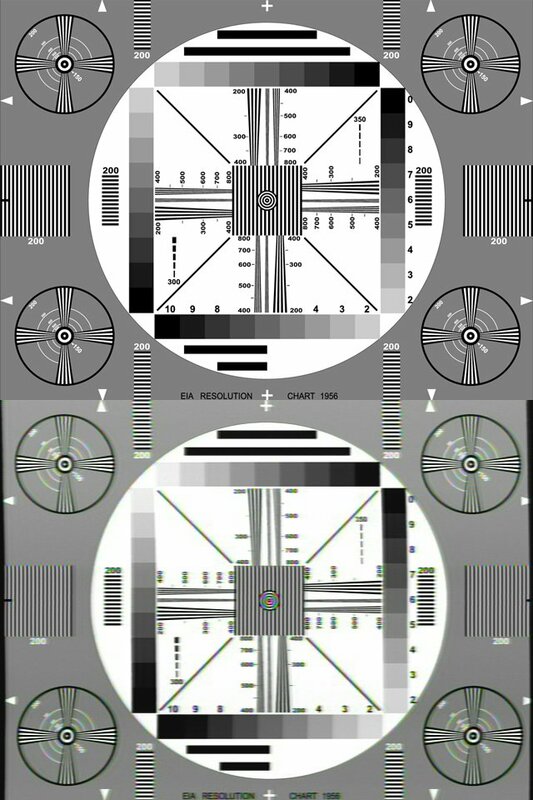 I then played it back through firewire into my PC and did a frame-grab, which is compared with the original memory-stick JPEG in the resolution pattern below. 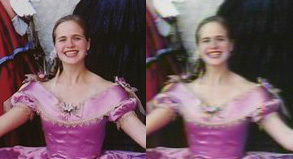 I see between 300 and 350 lines of resolution, which is in-between VHS and SVHS recording in quality. I show only stills here but the unit transmits full-motion video at 60 fields per second. Click on the smaller images below to see the full frame. I also tried the audio section of the unit. 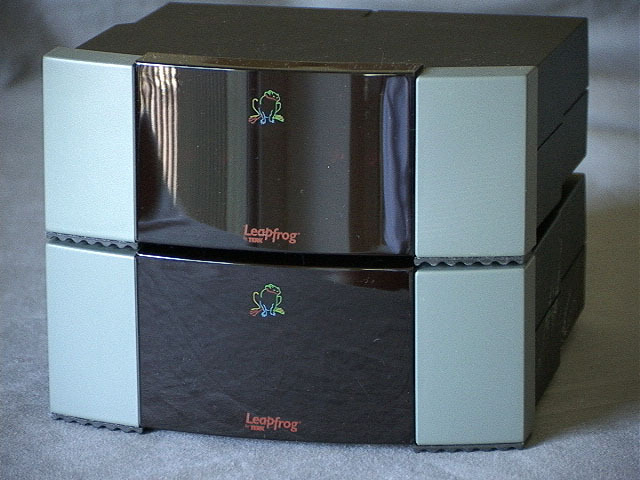 I sent audio from a CD player over the same 100' of phone line and I found the quality to be very acceptable; there was no obvious noise or distortion. You can send audio without having a video signal present. You can also point your remote at the receiver unit which will send the signals back to the transmitter side and re-transmit them as IR. I tested this and was able to view a camcorder signal from my living room in my bedroom, and control the camera's zoom setting with the remote on the far end. The transmitter unit does have to be within view of the camera's IR remote sensor, of course. I also tried connecting the unit as it is advertised for use, to a working phone system. I noticed additional noise or "snow" on the video image when the phone was not in use, and some wavy line patterns when I actually picked up the phone and began speaking in to it. Also, the IR remote control did not seem to work when the phone was off-hook. Going the other way, the video signal does not interfere with the voice phone: I could detect no audible noise or difference with the phone from before I connected the video unit. In conclusion, I found the unit quite useful as a remote video monitor. I would not use it for critical video recording, but the signal quality is adequate for monitoring, especially if you run your own dedicated wiring, which is quite inexpensive. The audio quality is quite good and might even be adequate for recording purposes. The unit offers the option of IR-remote control of your camcorder or other video source. According to the manual, it can go well beyond the 100' length of wire I used in the tests. The set costs about $150 (list $180). For more details, see www.terk.com. Radio Shack "A/V Home Network" #15-1975 ($150) has the same description as the Terk unit above and may be the very same design (has different package styling). Radio Shack also sells a 2.4 GHz Tx/Rx pair (#15-1971, $100), which will also relay IR remote signals. One reader on the TRV900 mailing list reports good results with the Radio Shack wireless unit sending video between floors in a house. If you're looking for a higher-quality signal, Elite Video makes the "Long Distance Runner" which claims higher resolution, and 600 feet range using speaker wire. It is about $340 (list $699).